Let’s face it, distributed ledger technology or “blockchain” is still in the very early stages. Just as in the early days of the Internet, it’s still unclear what kinds of projects will succeed. R3 is an enterprise software firm working with over 100 banks, financial institutions, regulators, trade associations, professional services firms and technology companies to develop Corda, a distributed ledger platform designed specifically for financial services. Over the last two years, R3 has worked with hundreds of senior technologists from dozens of leading financial institutions. No other enterprise blockchain platform has enjoyed remotely the same level of expert input. Chief Technical Officer at R3 Richard Brown, wrote a fascinating article in which he revealed, based on the last two years of research at R3, several key characteristics that are needed for an enterprise blockchain platform to succeed. The VooGlue enterprise blockchain functions (articulated in the whitepaper) include automatic payments to entities in the valuchain and the associated workflow required. The data management architecture for easily and securely updating an artwork’s records allows the providence of artworks to be permanently recorded in their own blockchain. With this in place, copyright ownership for payments of royalties, marketing affiliate and gallery records for payments of commissions, and the messaging functionality for these records to be easily and securely updated, is ensured. On top of this is an integrated token minting facility for easy tokenization of artworks, enabling artworks to function as investment items. Finally there are the access structures required for the blockchain to perform as a fully distributed database application where any correctly coded application can engage and interact with the VooGlue blockchain to access the data and perform transactions using an API. VooGlue, as a distributed application, allows any stakeholder – for example an online gallery – to access via API all VooGlue facilities. This includes fingerprinting, accessing digital counterparts, and selling artworks without having to relist the artworks on a new platform time and time again. Stakeholders can be any stakeholder, from an artist to a major museum. VooGlue provides the shared distruputed database and access standards for all users. As artwork changes hands, moves to new galleries, and changes hands again, providence is lost. Each new seller must then relist the artwork and try and trace its history. The VooGlue blockchain brings this waste to an end. This in itself represents a huge achievement, but the VooGlue blockchain brings additional value by adding a digital fingerprint that may include digital media counterparts locked into the single artwork rather than spread all over the internet. 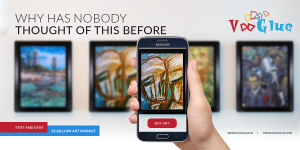 For example if an artist has created a Youtube video of the artwork’s production, VooGlue enables that video to become permanently connected to the original artwork itself. A VooGlue digital fingerprint once registered is singular and cannot be re-added, thus it offers the opportunity for legal enforcement of copyright. The blockchain built following that fingerprint provides a legal and irrevocable record of digital media counterparts and secure transactions related to posterity. It also enables the legal tracking of transactions related to digital media views, product counterpart sales, and artwork sales. The workflow of listing and marketing artworks, then the sales of artworks to new owners and the related financial transactions is the business scenario for which the VooGlue blockchain has been built. In addition, the VooGlue enterprise blockchain facilities this shared ledger to be accessed without rebuilding platforms or reinventing code. VooGlue enables businesses interested in accessing the VooGlue enterprise blockchain the opportunity to do so without having to create an expensive platform themselves. Here we use our shared technology to save countless stakeholders high risk technological bets.